Abundant Living Family Church’s “New Hope” program helps put newly released jail inmates on track for a new and stable life, according to Abundant Living’s Pastor Mark Graham. Led by Corey Moore, the all-volunteer program provides clothing, food, cell phone access and transportation to the individuals who are released. As of May 31, 2018, the program has serviced over 13,445 individuals reentering our community. The “New Hope” program is adding statistical measurement, case management for the individuals being released and a focused effort on children of those incarcerated and youth who have had a negative contact with law enforcement. “It is our hope to stop the incarceration in the first place,” Pastor Graham said. “Abundant Living has created a program called, ‘Pathfinders’ and we are partnering with Desert Mountain Community School, which is an alternative education program for youth who are struggling in the traditional educational setting,” the Pastor said. 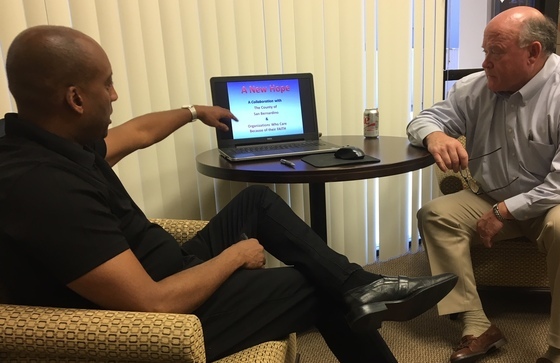 “Our staff, works on three campuses, five days a week mentoring students, doing strength-based assessments and career and college planning.” From January to June 2018 program volunteers have mentored over 90 students (over 75% of the student enrollment) making over 370 continuous mentoring contacts. Students who were not doing well are advancing in a positive manner, no more negative contact with law enforcement and some are going on to further their education. Pastor Graham and his team are working on a “Sleep Center” to safely provide a place for individuals who are homeless or just being released from incarceration a place to rest and regroup while they get help putting together a plan. For more information, visit www.abundantlivinghd.com. How can my First District staff serve you? Just let us know. The Sheriff's Department welcomed community members and civic leaders to the grand opening of the Sheriff's Department's first ever recruitment center. Facing attrition challenges, the department brainstormed and came up with the idea of a recruitment center to fill vacancies of not only safety members, but professional staff members as well. Annually, the department hires 250 law enforcement officers and 250 professional staff members, ranging from office assistants to medical staff and many more. A five year funding model was presented to the Board of Supervisors, which allowed the department to establish a recruitment team made up of both professional and safety staff, who actively market opportunities within the department at several public events and job fairs. Smart Start is a free program offered by the CHP in conjunction with the Office of Traffic Safety. It is designed to give helpful information and open the eyes of younger drivers between the ages of 13-19 to the importance and responsibility it takes to drive a vehicle. The next class will be held at the Victorville CHP office on Aug. 22, 2018 at 6:30pm. There is limited seating so if you are interested call the Victorville CHP office at 760-241-1186 to reserve your seat. Entrepreneur, international best-selling author and award winning film director Chris Gardner will serve as the keynote speaker for the High Desert Opportunity Summit on Thursday, Oct. 25 at the San Bernardino County Fairgrounds in Victorville. Gardner is possibly best recognized as the character serving as inspiration for the film “The Pursuit of Happyness,” starring Will Smith. The film chronicled Gardner’s rise from a single homeless father to a successful Wall Street businessman. The economic forecast will feature the event’s first female economist, Sarah House, director and senior economist with Wells Fargo Securities. House covers the U.S. macro economy, including the labor market, inflation trends, and manufacturing sector. For future updates, visit www.HighDesertOpportunity.com or visit www.Facebook.com/highdesertopportunity. “Impressions of Blue Cut, Ruins / Renewal,” a photographic essay by Benoit Malphettes, is open now through the end of the year at the Victor Valley Museum in Apple Valley. In August of 2016, the Blue Cut Fire tore its way through the Cajon Pass. Over the course of eight days, it burned over 37,000 acres and destroyed hundreds of homes and buildings in its path. 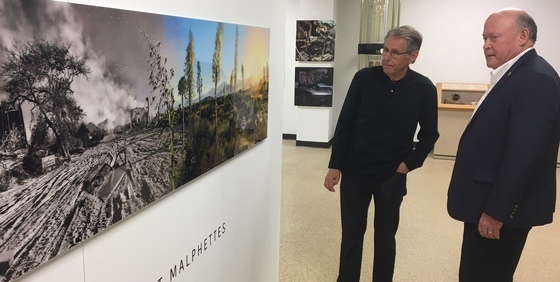 Although the destruction left by the fire created a desolate setting, esteemed photographer Benoit Malphettes along with his wife and business partner Katherine became interested in the resulting landscape. The images they captured, while filled with devastation and loss, also revealed nature’s ability to renew. The Victor Valley Museum is a branch of the San Bernardino County Museum located at 11873 Apple Valley Road in Apple Valley. The museum is open Wednesday through Sunday from 10 a.m. to 4 p.m. Admission is $5 (adult), $4 (senior or military), and $2.50 (student). Children under 5 and San Bernardino County Museum Association members are free. www.sbcounty.gov/museum. Roy Rogers was King of the Cowboys. His wife Dale Evans was Queen of the West. Together, with a home in Apple Valley and a ranch in Oro Grande, they were High Desert royalty. See them in their first film together at the Victor Valley Museum on Friday, Aug. 10. The movie starts at noon; bring a picnic lunch and enjoy popcorn while you watch “The Cowboy and the Senorita.” The movie and popcorn are included with museum general admission. The summer movie series at the Victor Valley Museum concludes with “Paddington 2,” which will screen on Saturday, Aug. 25. The Victor Valley Museum is a branch of the San Bernardino County Museum located at 11873 Apple Valley Road in Apple Valley. www.sbcounty.gov/museum. Follow me on Facebook and Twitter for important First District news updates and information about upcoming events. This service is provided to you at no charge by the County of San Bernardino. Visit us on the web at http://www.sbcounty.gov/.